DC Explorers (formerly Interns to America) is an internship program powered by Discovery Camp in Columbus, TX, that gives students the opportunity to explore the difference that Jesus can make in us when we make a difference in others. By choosing a session, you’ll join the DCx team to explore paths of friends, faith, freedom, and fun by supporting the Discovery Camp program. We believe those familiar with the former ITA program will be excited by the redesign of the program that includes and expands many of the great things that Interns to America provided while exploring a fresh approach for the upcoming generation. DC Explorers is an internship program that gives students the opportunity to explore the difference that Jesus can make in us when we make a difference in others. Creating a safe space for students to explore what life with Jesus can be like. The DCX program has been created to walk explorers through a devotional program, and give them the opportunity to help the people around them. In the mornings, explorers will gather for group teachings, and in the afternoons will be assigned in various places across the campus. Each area is a fun environment where explorers will work side by side TeamDC. If your student liked being a camper at Discovery Camp, they will love being a DC Explorer. Here are the areas the DCX Program will cover while your student is us. No matter where you come from, we can all agree that everybody needs time to focus on their personal relationship with Jesus. Through our DC-X daily discussions, DC Explorers will be exposed to our core beliefs as believers in Jesus Christ. We’ll cover topics ranging from simple theology to current issues while also making space for the practicals, such as developing their personal Bible study. Friendship is a foundation to our DC Explorers program. Everyone is looking for their tribe, squad, crew, etc., but we’ll be exploring what it looks like to become that friend you’ve been searching for. It’s been said that “people who pray together stay together”, and we believe that people who play, laugh, learn and serve together REALLY stay together. Welcome to the team. The path to true freedom will be explored as students experience a week of serving others. When we learn how to drop our motives and pick up His mission, students will learn that loving Jesus isn’t a one-time thing or a DC thing, but a daily choice that releases true freedom forever. Beyond the normal DC fun of waterslides, horses and go-carts (did we forget to mention the quesadillas?! ), our DC Explorers will be challenged to take it to the next level. Don’t worry, Mom… It’s safe. We encourage you to select the best sessions for your Explorer based on their age and level of personal responsibility. 1What ages are accepted into the DC Explorers program? The DC Explorers program develops students ages 11-17. 2Is the DC Explorer program eligible for community service hours? The DC Explorer program is valid for community service hours to most outreaching organizations. A certificate of completion will be given to all participants at the end of their session. 3How long is a session, and how many can you attend? The length of each session depends on the type chosen. Starter Sessions are 4 days, Standard Sessions are 7 days and Super Sessions are 11 days. DC Explorers can enjoy up to 2 sessions per summer season. 4If I sign up for back to back sessions, can I stay on campus in between sessions? The only term that will allow people to stay on campus from Sunday-Monday is the Super Session. DCx will not be permitted to stay on campus from Sunday-Monday in the Starter or Standard Sessions, regardless of the terms being back to back. 5What’s the cost of the DC Explorer program? Registration includes Food, Lodging, T-shirt, Free Activities from a range of $80-$180 per Explorer depending on the session selected. 6What does the daily schedule look like? Developing Devos Devotionals created specifically for Explorers that will focus on the Bible basics that cover stories, and scripture that we model our lives after when we decide to follow Jesus. Team Time By serving side by side with TeamDC in different areas around Discovery Camp, Explorers get to participate in all the elements that make summer camp happen. It’s good ol’ fashion work with a twist of mentorship and fun. Fun & Free - Every Day Explorers will daily have the freedom to find fun around the campus with go-carts, horses, and water sports, as well as develop positive friendships. Miracle Moments - Every Night Every single night, Explorers will gather together and join hundreds of Discovery Camp campers as they go after God and see the power of the Holy Spirit move in a safe and spirit-led way. 7I don’t live in Texas. Can I still come? Sure you can! Airport Shuttles are available for Super Sessions only and the airport shuttle will run on the first and last days of the session. All airfare should be for the Austin–Bergstrom International Airport both ways. Arrival will be on the first day of the term between 9 AM - 12 PM and return flights should be booked for the final day of the term from 2 PM - 5 PM. 8Who will be responsible for supervising my child/student? Adult supervision will be accessible in all areas throughout the program with our Discovery Camp staff. Your Explorer will always be near support within the program. 9I’m a youth pastor. Can I bring my entire group? T-shirts will be provided. Navy blue shorts/pants are encouraged, dark jeans are acceptable. 11What does an Explorer do? 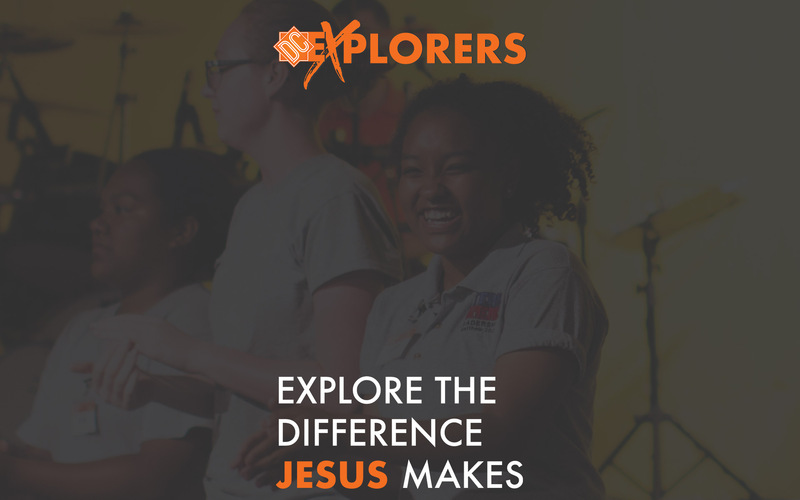 Explorers serve on various teams that support Discovery Camp while learning practical work skills, receive Bible training, as well as experience every Miracle service. 12What time does my session start? DCx Check-In will be from 12:00 PM - 1:30 PM on the first day of your session and Check-Out promptly at 12 PM on the last day of your session. 13What do I need to bring? We're glad you asked! Definitely bring your Bible, notebook, pen/pencil, bedding/sleeping bag, pillow, towels, toiletries, casual clothes and a swimsuit, along with spending money/offering. And don't forget your navy shorts and tennis shoes! We ask that you leave any water guns, water balloons, weapons/fireworks, tobacco/alcohol, skateboards/rollerblades and anything that could be a potential distraction at home. 14What happens if I register for DC Explorers then cancel? There are no refunds available for DCx cancellations. Any funds received before a DCX cancellation will become an automatic donation to the DC Explorers program. Please keep this in mind before you register, and thank you for your understanding. Don't see your question answered? Talk to our team!